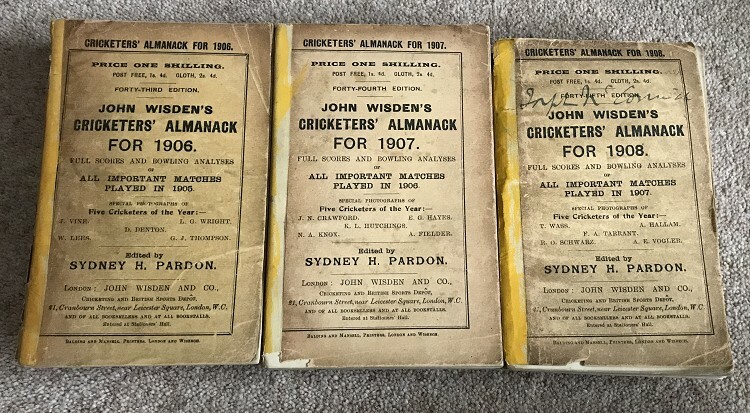 A set of 3 Wisdens, in a run from 1906 to 1908 all Paperback Wisdens all with facsimiles spines. The books are just £50 each as they are omly in OK condition, complete but the facsimile spines are quite amaturish and the bindings on the 1906 & 1908 are quit loose , the 1907 is by far the best one here. The 1906 also has some loss to the rear of the book as shown , some moths have takena liking to the corner of the book but only in the adverts. Cheap books to fill a gap or 3. With photoplates. Name to front cover of 1908More photos on request. P&P to the UK is £8.